What capabilities and performance does Beaglebone Black offers to hardware hackers and makers? Beaglebone Black is a single board computer and a Raspberry Pi challenger made by the BeagleBoard.org foundation. It offers 95 3.3V GPIO and newer CPU with Android and Linux support. In this article I'll go and check it performance and capabilities. Latest revision C has 4GB eMMC storage which by default caries Linux desktop. You can install other systems using available images (including Android). 8-bit eMMC storage should give better performance than 4-bit SD card interface (like in Raspberry Pi). 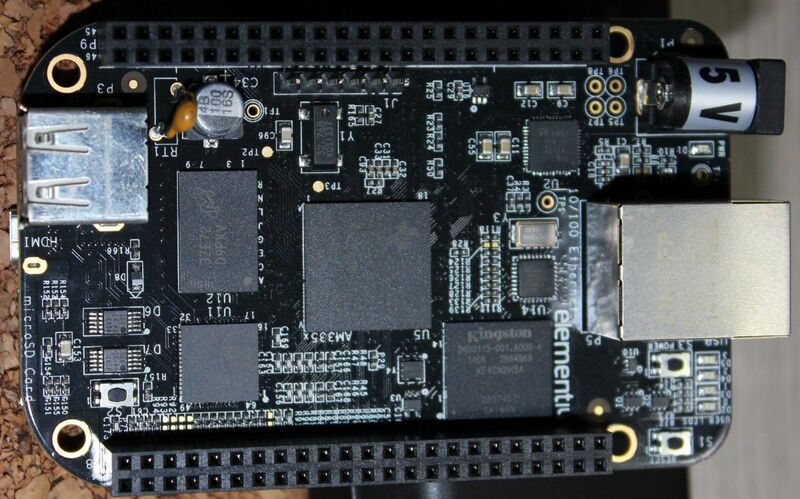 Beaglebone is powered by single core XAM3359AZCZ100 - Sitara Cortex A8 CPU. It's a newer generation than the Boardcom SoC in Raspberry and should be more efficient even at the same clock rate. The GPU is PowerVR SGX530, which is quite basic in terms of features and capabilities. 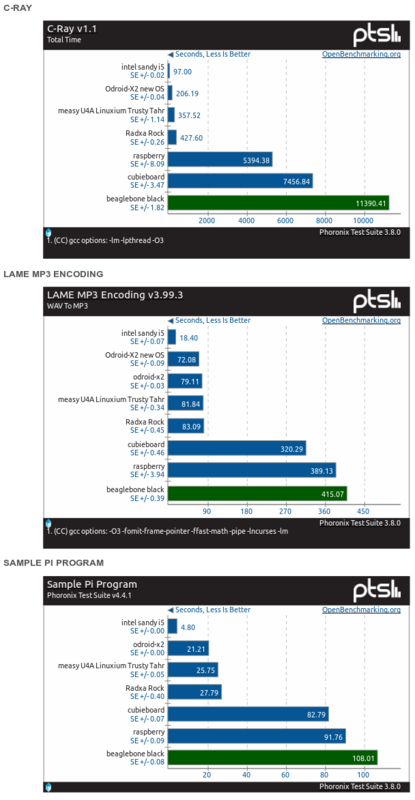 In many GPU/Multimedia usage cases Raspberry may turn out to be the a winner. We will also find 512 MB of RAM, microSD slot, 100 mbit Ethernet, micro HDMI (max 1280×1024) and USB, mini USB. The PCB has similar size to that of Raspberry Pi. We will pay around $60 on dx.com for the latest revision. Raspberry Pi in a shop is around $40. 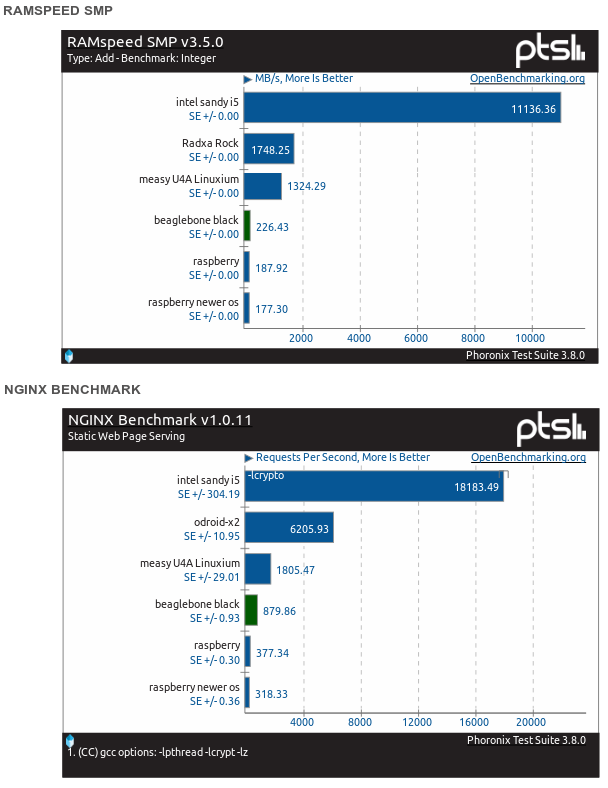 The RAM is only slightly faster than that in Raspberry Pi. RAM speed may have big impact on shared graphics performance (like in the case of AMD integrated graphics). 512 MB won't allow much so don't plan any database heavy usage (in case of MySQL or PostgreSQL). With the help of eMMC Nginx concurrent connections tests gives more than twice as good result as that on Raspberry Pi. Even so quad core Android dongle - Measy U4A gives even better result (and they are very cheap now). 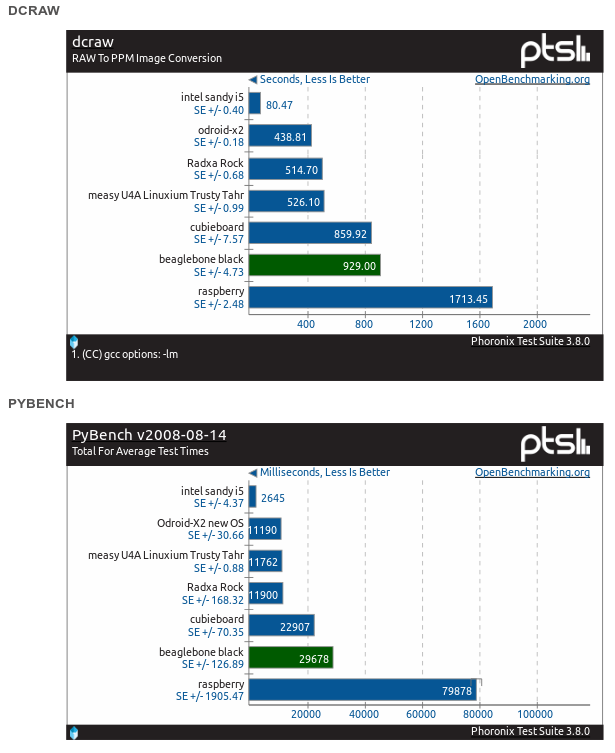 C-ray benchmark is supposed to test floating point operations performance of the CPU. On ARM it like to give surprising results like if GPU also played a role in it. As you can see Beaglebone Sitara or Allwinner A10 did not beat Raspberry score. The Sitara CPU has the NEON floating point coprocessor so it's even more surprising. Calculating the Pi number also didn't turned out well for Beaglebone. Waw to mp3 conversion also. It seems like all multimedia operations on Beaglebone Black will have low efficiency. I've reviewed Radxa Rock and it also has two long rails of GPIO. What makes Beaglebone better is the availability of high level libraries for the GPIO. There are also tutorials showcasing how to use them in Python using available libraries. It won't be as much as for Arduino (C) or Raspberry but still it's a good level allowing users to start using them without searching the web or forums for a long time. Check slideshare or learn.adafruit.com for some tutorials examples. As the GPIO are 3.3V it may be harder to use cheap 5V Arduino-compatible Chinese boards.